12/16, 61/45, sunny, W10-15 - This morning, by 7am, the sun was illuminating the sky, turning pale purple and dusky blue into blushing pink and orange. Bacon is just too good to resist, so we enjoyed another breakfast of bacon, kale, eggs, and toast. I did the washing up and Dobbs walked Murphy. I bought another 20lbs. of ice for the ice box (about every 4 days now). I wrote for our blog and then practiced Spanish for the remaining hour-and-a-half before lunch. A day so beautiful, my heart ached to see the sailboats going out while we wait at the dock for repairs. After lunch, we drove out to Jarvis Creek Park - I’d heard about a walking trail there. 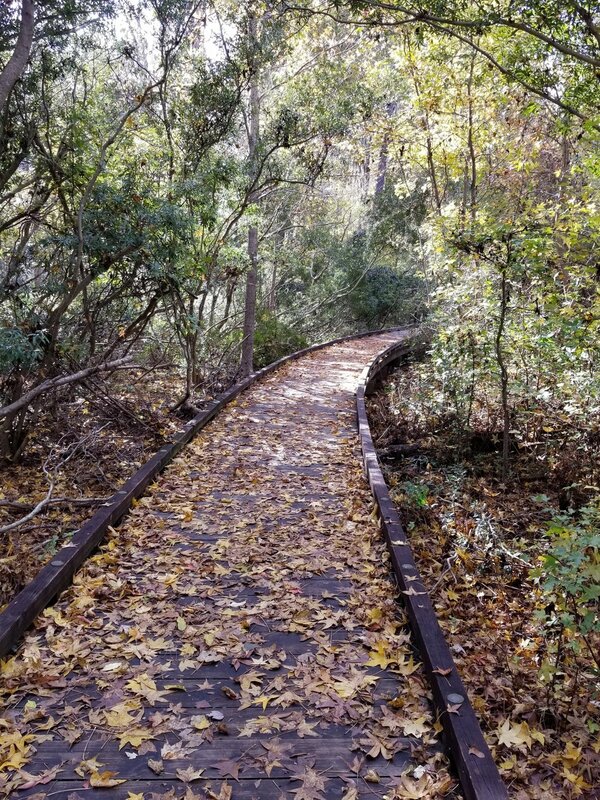 The park consists of a man-made freshwater lake that is designed to contain stormwater runoff, a paved path and boardwalks that circle the lake, a short trail, and recreational facilities (playground, picnic pavilions, restrooms) for visitors. We’ve seen “Don’t Feed the Alligators” signs around Hilton Head Island, so I’ve been giving the hard stare to every marshy area we pass, hoping to spot one. WELL… I was expecting what I imagined to be “suburban” alligators - you know, smaller ones - 3-4’ long tops, and I thought they’d be closer to the water’s edge. Instead, we almost stumbled over the first pair, 4-6’ long ones that were sunning on the lake shore. I just stood and stared in wonder - reptiles, THAT BIG, not in a zoo, and nothing between me and them but a bit of lawn. We saw plenty when we crossed Florida on the Okeechobee in 2015, but we had Grace as a buffer. Continuing on, we saw four more of roughly the same size. Then as we approached the corner at one end of the lake, it was impossible to miss the large (8’) black leathery, scaly mass resting on the bank. Whoa Nelly. We could see its white fangs sticking out over its lower jaw. I felt my status as head of the food chain rapidly slipping and clung to Dobbs a little tighter. 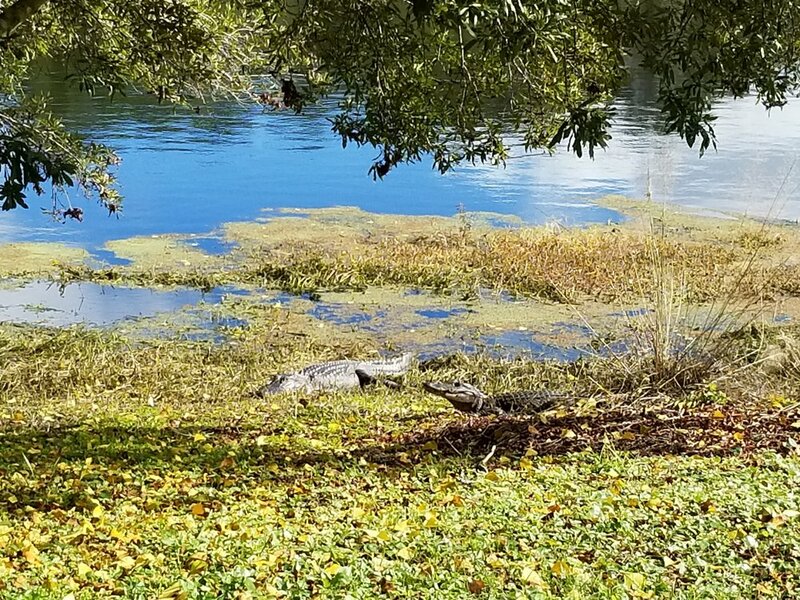 I thought to take a video to try to better show the scale and surroundings, because it’s rather non-sequitur to have people going by on bicycles and walking dogs and hearing children playing, while hoping not to be attacked by an alligator. Our star ‘gator gave a good showing and started to move toward the end of the video - that’ll help with realism! We carefully and expeditiously continued on our way. At various points along the path, there are signs describing how the area of the lake was once cleared for pasture as part of the Honey Horn Plantation. The designers kept a prominent live oak as a focal point. We returned to the marina around 3pm and decided to practice juggling. Dobbs focused on coaching me, to improve my form. I need to toss the balls more “out”, toward the outside of my shoulders, and less “up”, and I’m also working on lowering my hands and relaxing my shoulders. Murphy got his afternoon walk and then I read for a bit. For dinner I made chicken thighs and drumsticks with stuffing and giblet gravy, green beans, and cranberry sauce. We cleaned our plates.